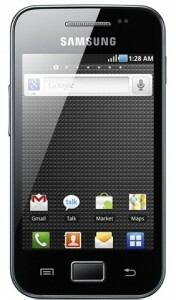 Samsung launched a new Android based handset Galaxy Ace in India. The Galaxy Ace is positioned in the medium price range where we already have the HTC Wildfire, LG Optimus One and some other affordable Android smartphones. When compared with mobile phones in same price range, Galaxy Ace differs mainly on the screen size (3.5″), processor and camera quality. Galaxy Ace has an external design that resembles Galaxy S, Samsung Star and iPhone 3G S.
Samsung Galaxy Ace has 3.5 inch, LCD touch screen with 320 x 480 pixels resolution. The screen is responsive but the clarity of icons and text is not that impressive. It is enclosed in a mostly plastic body with iPhone like form factor. The back side of the Ace is la bit textured and shiny, and it hosts a 5MP auto focus camera with LED flash. 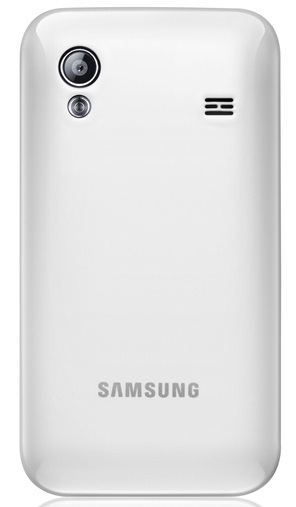 Samsung Galaxy Ace has a minimal design- there aren’t many buttons and controls except those required by the OS. Galaxy Ace comes with Android OS 2.2 Froyo with the latest Samsung Touch Wiz 3.0 interface. There are some inbuilt Samsung applications like Readers Hub, Media Hub, etc., for social media connectivity and other web based services. Swype typing enhancement app is pre-loaded in Samsung Galaxy Ace, but some may find the Android keyboard more useful. Samsung Galaxy Ace a very good processor, an 800MHZ Qualcomm built with inbuilt Adreno 200 GPU. Games and web browsing is pretty much fast and smooth. There is 156MB of phone memory and up-to 32GB external storage support (2GB card included in the package). Overall, it’s a great buy at the current price level. Check out the full specifications of Samsung Galaxy Ace here. The suggested latest price of Samsung Galaxy Ace in India is 14990, which is very cheap considering the features it has. On the other side, HTC is planning to launch HTC Wildfire 2 in the coming few weeks. So if you are an HTC fan you could wait for that before making a final decision. You can compare Samsung Galaxy Ace, HTC Wildfire and other smartphones here.